Farmed salmon is something we eat regularly, it can be a little bland, so it's nice to dress it up with some punchy flavours. This recipe exceeded both our expectations and is definitely going on my summer favourites list! 1. 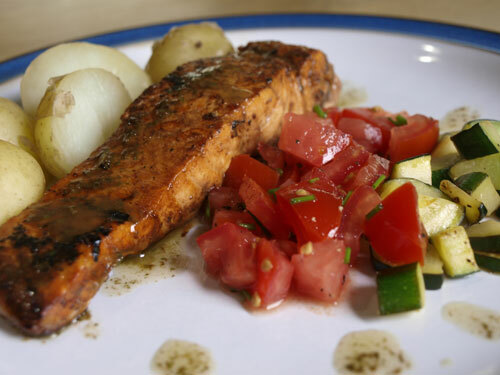 Place the salmon steaks in a shallow non-metallic dish. Mix the balsamic vinegar and soy sauce together and pour over the salmon, turning to coat. Cover and leave to marinate in a cool place for 30 minutes. 4. Lift the salmon out of the marinade and place skin side down in a hot pan with a little olive oil. Cook for 4 minutes each side, once cooked add the rest of the marinade to the pan and reduce to a syrupy sauce. 5. Whisk the basil oil briefly at this stage to re-combine. 6. Spoon the tomato mixture onto the warmed serving plates and place a salmon fillet on top. Drizzle with the basil oil and spoon on the reduced marinade. Serve immediately, garnished with basil. The eagle-eyed amongst you will notice that there are also some courgettes on the plate. They came straight from the garden, chopped into small dice and cooked in a little olive oil in a pan with lemon zest and a teaspoon of lemon juice, seasoned with rosemary salt and pepper. And finally some boiled new potatoes to soak up the juices. You are speaking my language with this one! I've never combined soy sauce and balsamic before. Something I must try. I am making this for sure! My daughter and family are down from NY and she is making birthday dinner for the whole family. Sweet girl! What a wonderful meal, and a great way to make the changes with salmon too! Salmon....ooooh....my favourite! I love salmon cooked in all ways. I must try with balsamic vinegar one day. Looks very delicious.